“THE ASTROLOGY GAME OF CARDS”© IS HERE! PISCES CARDS SHOWN ABOVE – ALL 12 ZODIAC SIGNS FOR A TOTAL OF 48 CARDS ARE INCLUDED ALONG WITH SUGGESTED CARD GAMES. A FUN AND EASY WAY TO LEARN THE AGE-OLD SCIENCE OF ASTROLOGY! See my later posts for More Information! Some are saying that for the first time in over two thousand years, the star of Bethlehem will reappear in the western sky, tonight, June 30th. This is of both historical and religious significance, the last time this particular celestial configuration was seen, the first coming of Christ was recorded in the New Testaments of the Holy Bible, between the years 3 and 2 B.C. Venus is the planet named after the Goddess of love, and Jupiter is named after the God of Thunder. On Earth, they will appear so close together that they will look like a dramatic “double star.” These two planets have been gradually approaching each other for the last few weeks, creeping toward their closest point: 1/3° apart. That’s close enough to be able to see them while covering them with the tip of your pinky finger. Actually they are about 416 million miles apart in space. The planets will also look like they are the same size, but Jupiter is the largest planet in our solar system and Venus is smaller than our Earth. Because of their relative distances, they appear to be of a similar size when viewed from Earth. 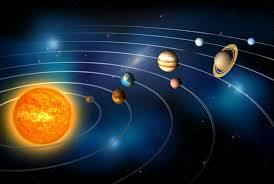 This converging of two planets is known as a conjunction. A conjunction between Jupiter and Venus is not unusual; they were last seen close together in the sky in August of 2014, but this is an extremely close conjunction like the one believed to be the bright double star the Wise Men followed in Bethlehem . Look West to Northwest tonight right after dark and you will see them with the naked eye. The Moon, Mars, Mercury and Saturn can also be easily seen tonight. 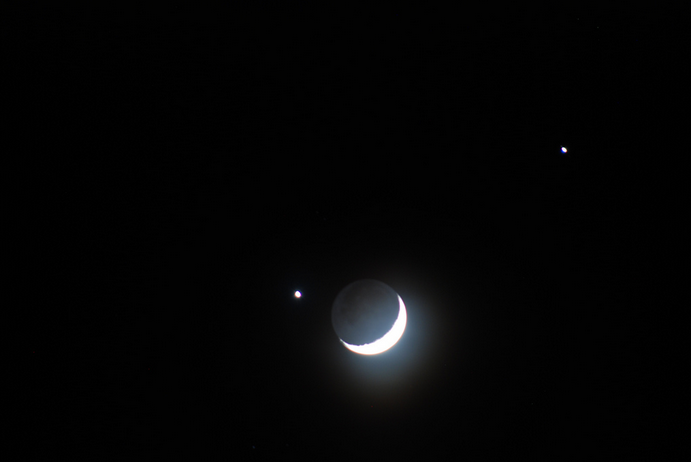 If you use binoculars or a telescope, you can actually see Jupiter’s four large moon. Note: The above picture was taken this evening of Jupiter and Venus together from the App called “Skyview” ! Oh Jupiter, do you have to go retrograde again? We always look forward to your visit to our Sun sign and Rising Sign with all the opportunities you bring. Well, we can look forward to having you go direct again on April 9th! Meanwhile, Jupiter is taking a little vacation and letting us all think about the benefits we have received so far. More goodies to come in April, especially for the Leos and Leo Rising Sign people. 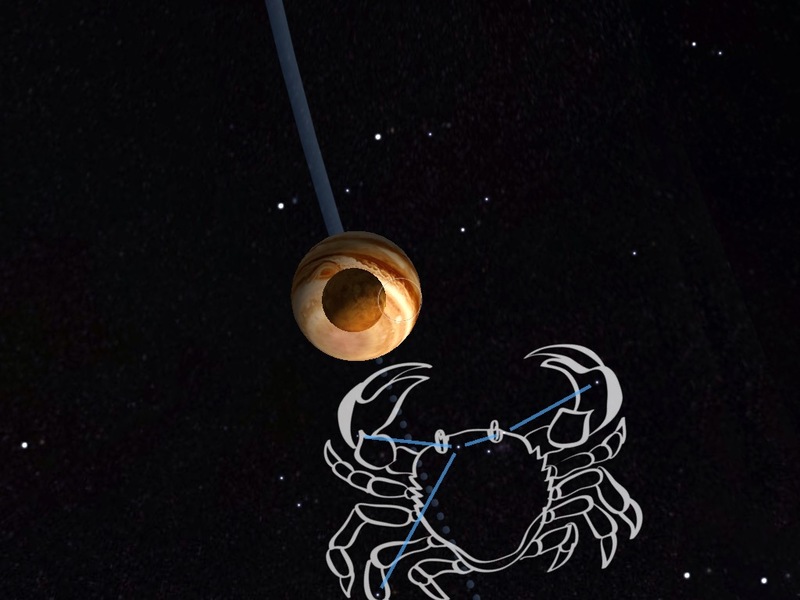 Whichever House Jupiter transits in your horoscope wheel, you will get some kind of benefit!